The island of Lesvos: Garden of the Aegean as the Ottomans declared her; and the gorgeous olive groves and pine forests can still be seen. 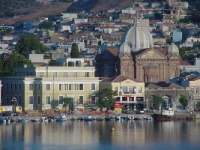 Lesvos is also famed as the Ouzo capital of the Aegean with each village producing its own distinctive brand. Birthplace of Sappho - first lady of Lyric Poetry - and still an inspiration for the more enlightened literary historians. Lesvos has something of a New Age feel in parts. 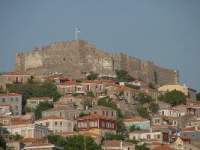 MYTILINI is in fact one of the most culturally enlightened city in Greece perhaps due to its proximity to the coast of Asia Minor where the ancient Greeks flourished until 1922 when they were forcefully evicted by the Turks. Many of these Greeks had property in Mytilini and many Mytilinians had businesses in Asia Minor. For this reason the museums are full of interesting remnants of the last three thousand years of history and the town itself contains monuments, houses, churches, schools and other buildings from the various historical periods. But it is the Mytilini of today that holds the most interest for many because it is a small and manageable city full of great restaurants, cafes, nightlife and friendly, intelligent people. 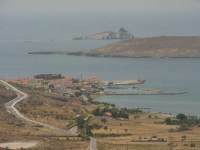 On the southwestern end of Lesvos is the village of ERESSOS and SKALA ERESSOS. 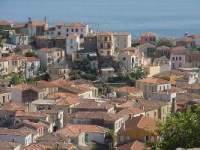 The birthplace of the poetess Sapho, the beach town of Skala Eressos once a Mecca for International lesbians is also a popular family destination, not to mention a favorite place for honeymooners. It has one of the most beautiful and dramatic beaches in all of Greece and a line of cafes and restaurants on the waterfront that may remind you of an Atlantic seaside community without the commercialism. Mithymna, or MOLYVOS as it was called during the middle ages, is truly an amazing town. When you pass through Petra and follow the coastal road you really are unprepared for the dramatic first view you get when you come around that last bend. Luckily there is a place to pull off where you can take it all in, rather then sneak glances and endanger your family and everyone else on the road. The town is situated on a small mountain topped by a dramatic medieval castle, built by the Byzantines and renovated by the Gattelusis, who were from Genoa and were ceded the island when Francesco Gattelusi married the daughter of the Byzantine Emperor John Paliologos. The original castle which this one replaced, was conquered by none other then Achilles during the Trojan war. There are still ancient ruins scattered around the town including impressive polygonal walls and a few giant holes where archaeologists have begun their slow work. The town itself is built of stone houses and shops which surround the castle and follow the coast to one of the most beautiful harbors in Greece. 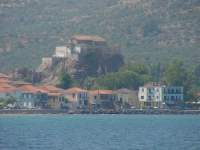 Just a few kilometers from Molyvos is the village of PETRA. Petra is attracting more and more visitors every year. While the front of the village appears to be a tourist town of the highest degree or lowest depending upon how you look at it, the back streets of the village give the visitor the feeling of the more remote traditional villages of the island and since most of the tourists tend to cling together like sheep along the shore, those people who are courageous enough to wander through the back streets can find themselves in a uniquely Greek setting, maybe finding what they have come to Lesvos in search of. Stretched along a long human-filled beach lined with cafe's and restaurants, the interior of the town surrounds a rock mountain topped with the church of the Glykofylousa Panagia Our Lady of the Sweet Kiss. You reach the top of the rock by climbing the 114 steps carved into the stone. From the church the view of Petra and the surrounding sea and countryside is spectacular extending all the way to the coast of Asia Minor. The Bay of KALLONI and in particular the beach town of Skala Kaloni is the nature capital as well as the sardine capital of the island. The economy in based upon agriculture, the nature tourism from visitors who come to see the many birds who stop in the marshes on their way to and from northern Europe, and from the sardines and other fish and seafood that comes from the rich and beautiful bay. The town of Kaloni sits in a lush and enormous valley that borders the bay of Kaloni. This valley is home to many different species of birds and wildflowers and in springtime the hotels are full of bird watchers from all over the world. The bay itself is a marvel to behold. More like an inland sea then a bay, it is ringed by mountains on two sides and the fertile valley on another opposite a small channel that leads to the sea. The town of Skala Kaloni is both the port, beach and tourist center of Kaloni. The water is shallow and almost never rough and the beaches are very sandy. Located on the coast between the Gulf of Yera and the Gulf of Kaloni, near the town of Polychnitou and the amazing hot mineral baths, VATERA is seven kilometers of uninterrupted sandy beach. This is one beach that seems to extend forever. The town of Vatera itself stretches a couple kilometers and is made up of some really nice tavernas, a pizza place or two, several small bars, a few shops and some terrific family oriented hotels. Forty-two kilometers from Mytilini on the southern coast of Lesvos, PLOMARI, the ouzo capital of Greece, is built in an amphitheater style near the sea and is the second largest town on the island. This is where the famous Barbayiannis Ouzo comes from as well as several other smaller labels like the excellent Ouzo Giannatsi which is distilled in the traditional method. The architecture of the town is pretty amazing with giant old mansions and decaying factories, olive presses and tanneries amongst the houses of all different size shapes and colors. The town itself straddles each side of a ravine which in the rainy season turns into the Sedountas river. Some of the houses are built right on the river and their walls form the banks, keeping the flow contained and moving down towards the sea. SIGRI is a beautiful town with a nice beach in a long semi sheltered cove that is perfectly suited to families with small children and some good restaurants with plenty of fresh fish, caught locally, and their specialty which is lobster. To make it even more special there is a big old Turkish castle that overlooks the whole village. In Sigri you have a town that is everything a good tourist town should be. Good food, clean beaches, nice hotels, great family run restaurants with fresh fish, stuff to do and even a tourist shop or two, and yet it is not overrun with tourists. Sigri is certainly at the very least worth a visit for lunch and a swim. 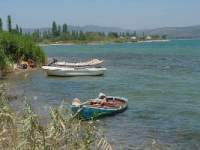 The Gulf of YERA or Gera has to be one of the most beautiful area in Greece and therefore in all the world. Like the Gulf of Kaloni it is a large bay with a small mouth and a breeding ground for sardines and other fish and sea creatures. 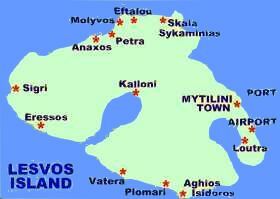 Also like Kaloni it is surrounded by olive groves and forests and some of the most fertile land on the island. 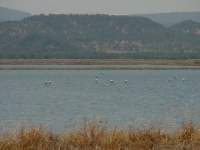 There are large areas of wetlands and marshes, home for wild birds and animals and there are also hot-springs in the area of Thermi, a 15 minute drive from the city of Mytilini. There are a number of small seafood tavernas that serve the freshest local fish and are inexpensive. The towns in Yera are mostly agricultural and those on the coast of the bay were formerly industrial with tanneries and olive-oil factories. The ruins of these factories create an interesting background to the natural beauty of the sea and coast.